This bundle contains 6 PowerPoint Presentations, 1 assessment, and Exploration Stations to better understand halves and fourths. 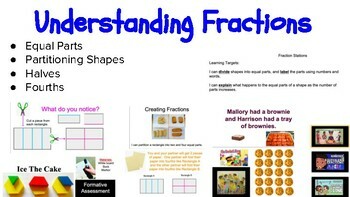 There are also differentiated challenge games and songs for students ready for harder fraction concepts. I have also included links to numerous free resources such as songs and games that I have used with my own students to enhance their understanding.